Provide comfort for the family of Robert Gibson with a meaningful gesture of sympathy. Robert J. Gibson was born in Beaver Falls, Pennsylvania and was one of eight siblings. Together the large family worked to survive the Great Depression, as did so many families of the era. After the attack of Pearl Harbor and the start of the second World War, Robert joined the military and served in the U.S. Army from 1942 to 1946. His last assignment was in Linz, Austria where the Allies: Russia, England and the United States occupied the city upon the completion of the fighting. It was at the American Red Cross where Robert met his future wife, Inge, a native Austrian, who had decided to volunteer at the Red Cross. Romance bloomed during the occupation! Once Robert returned home to Pennsylvania, he worked to save enough money to bring Inge to the U.S.. They were married on Inge’s birthday in 1947 and this past summer they celebrated their 71st wedding anniversary. 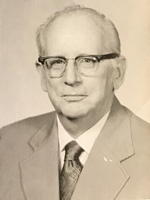 Robert was a graduate of Washington and Jefferson College (Washington, PA) and ultimately spent his career in supervision with the Babcock and Wilcox Steel Company in Alliance, Ohio. He and Inge spent most of their retirement years in Canton, Ohio prior to moving to Willowbrook Assisted Living, Thiensville, Wisconsin in 2017. Robert leaves behind his wife, Inge, daughter and son-in-law, Linda and Lynn Unkefer and beloved grandson, Elliot. To send flowers in memory of Robert J. Gibson, please visit our Heartfelt Sympathies Store.